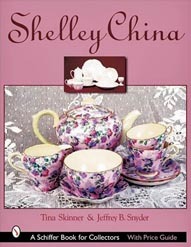 A grand assortment of the prolific Shelley Pottery's products is illustrated in this 176 page book, including works by their predecessor. Over 500 photographs show more than 1,000 pieces, including dinner ware, tea and coffee sets, jelly moulds, ashtrays and souvenir items. There is a guide to backstamps; a buyers guide to fakes, reproductions and damaged items; a pattern index and current market values.